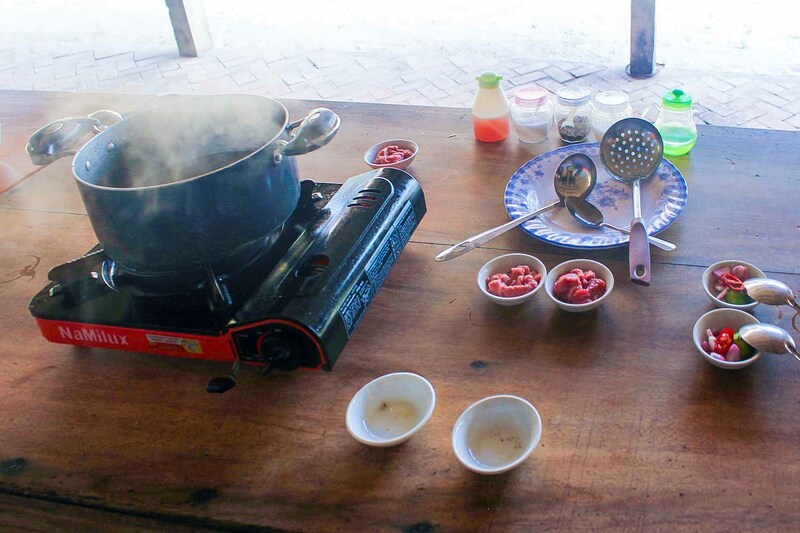 Cooking a 4 course Vietnamese Lunch was my most authentic cultural experience in Vietnam. 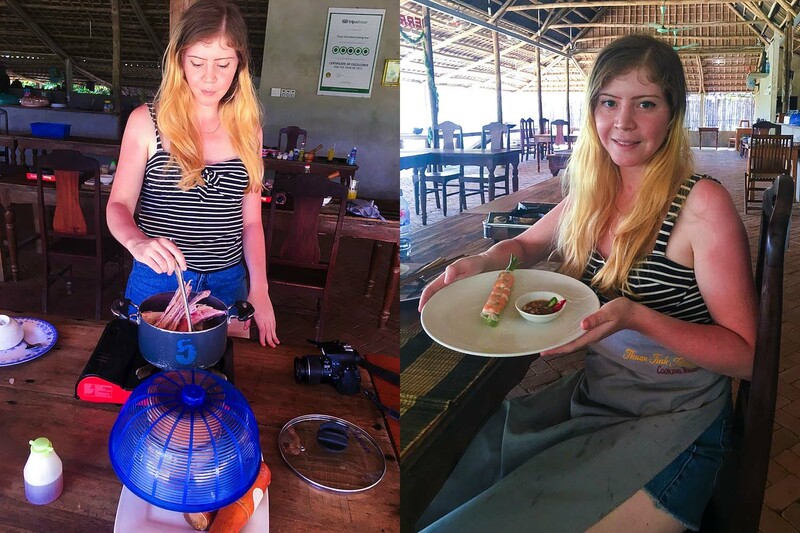 Personally I don't like cooking, but when our hotel recommended us a traditional Vietnamese cooking class and told us it is their most highly rated day excursion, we thought to ourselves why not? 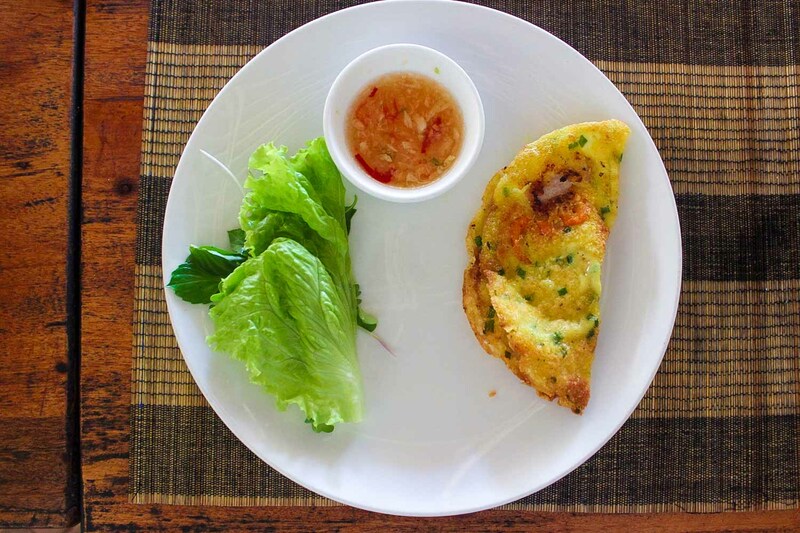 We had a moderately lazy start to the day, picked up by our guide at 12pm for the afternoon class with the Thuan Tinh Island Tour. 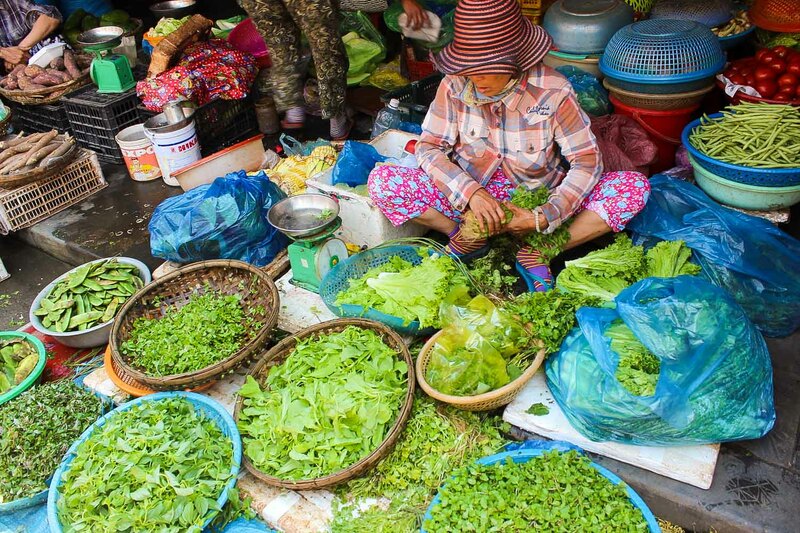 Our first stop was an outdoor market where we picked up fresh ingredients for our dishes. Our guide pointed out many different produce that can only be found in Vietnam (plus we got a free tasting because our guide is well known in the market). After shopping we drove to the cooking class HQ which was located in a lovely outdoor space by the river. The morning class of 20 was cramped up still using half the floor space, but since our group had only 4 we spread out on one large table each. 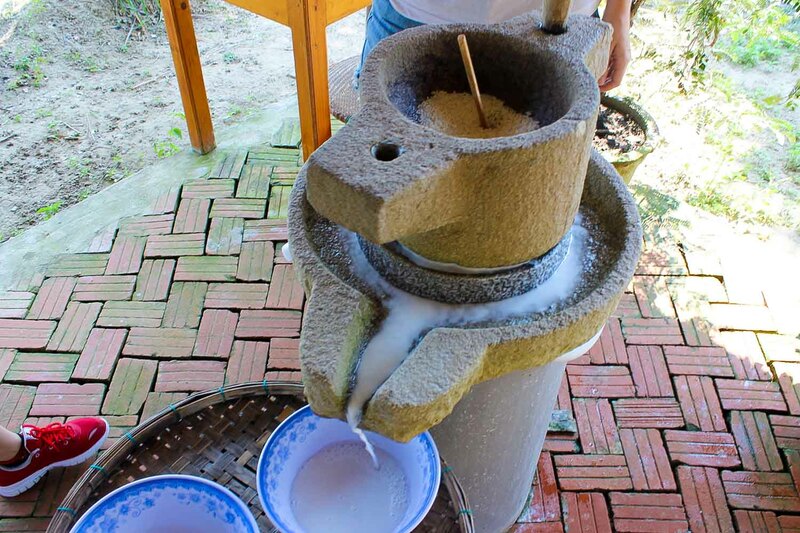 Our chef first showed us how the Vietnamese traditionally made rice flour before modern technology using a stone grinder. 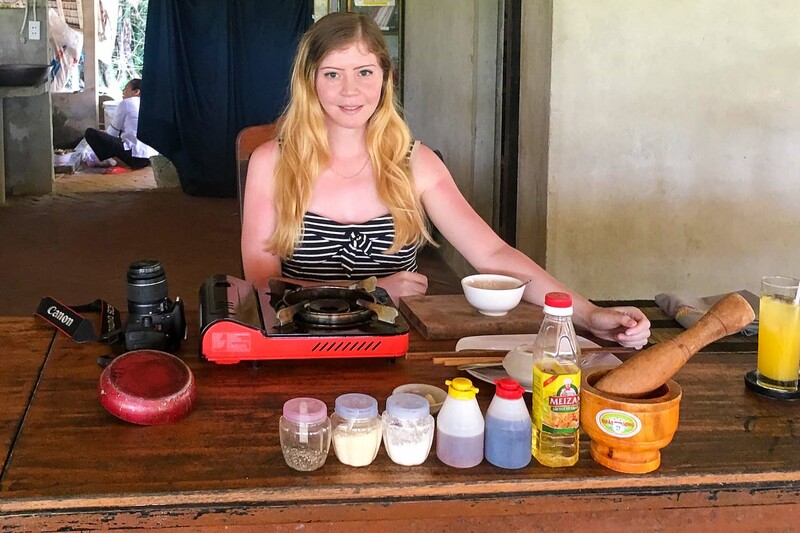 Rice flour is a staple in Vietnamese cuisine, used to make rice paper and noodles. 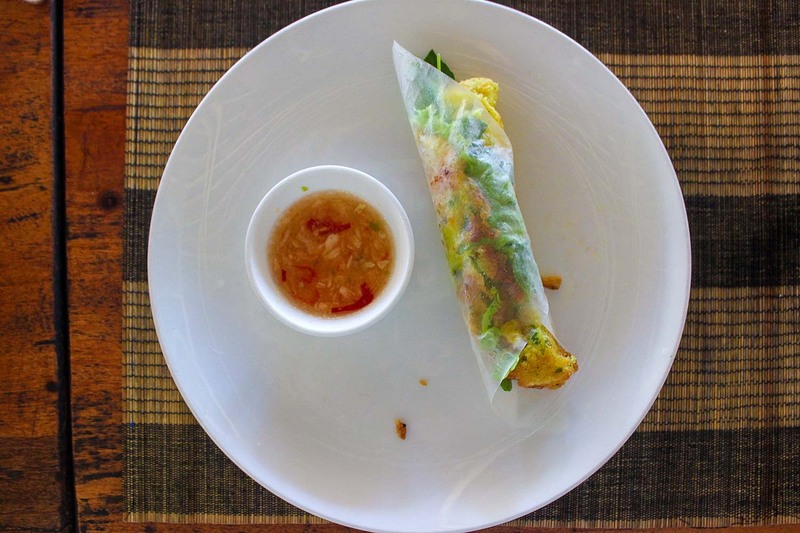 Our first dish was Goi Cuon aka Vietnamese Salad Rolls with a side of Nuoc Leo, or Peanut Hoisin Sauce. A staple in Vietnamese restaurants back home, I recognised these almost immediately when our chef did a demonstration. 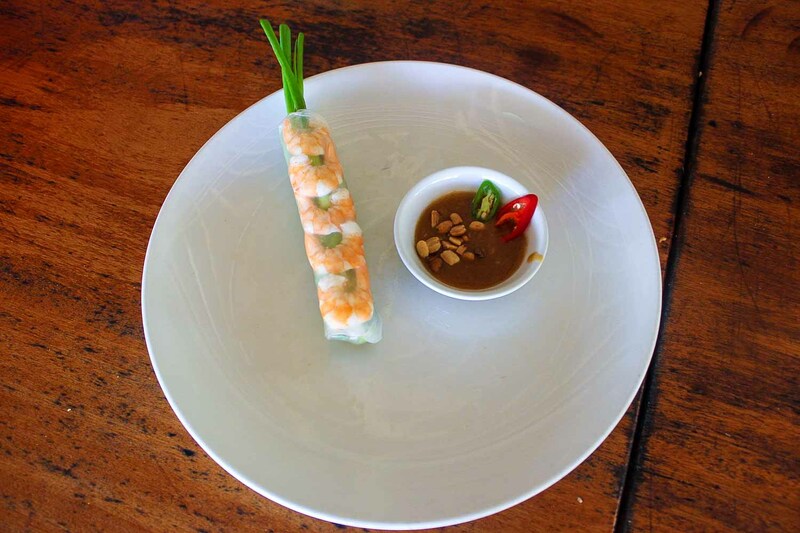 In order to make the rolls look aesthetically pleasing our chef taught us a trick to roll the filling first and leave the shrimp to the end. 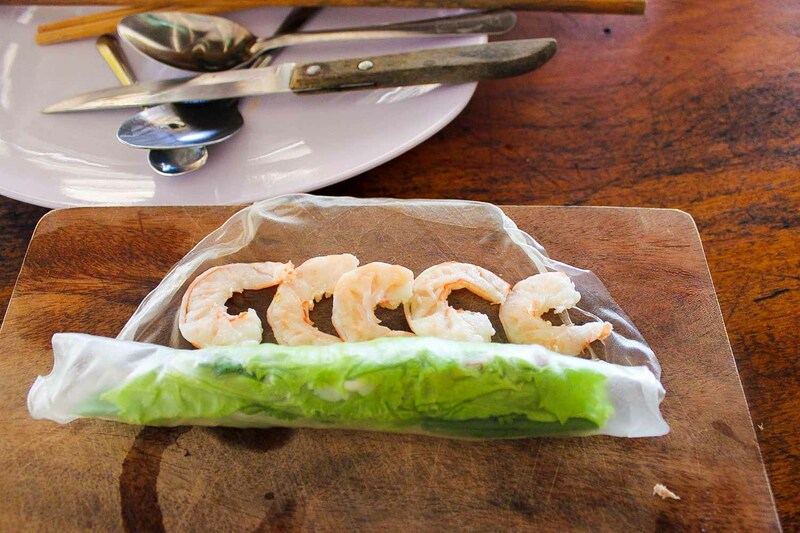 This is so the most decorative part of the roll (the shrimp) can be seen in the finished product. Voila! My first ever rice rolls with peanut sauce. Considering how healthy and easy these are to make I would definitely do these back home for a light lunch snack. Our next dish was something I had not seen before - Banh Xeo - sizzling Vietnamese crepes. 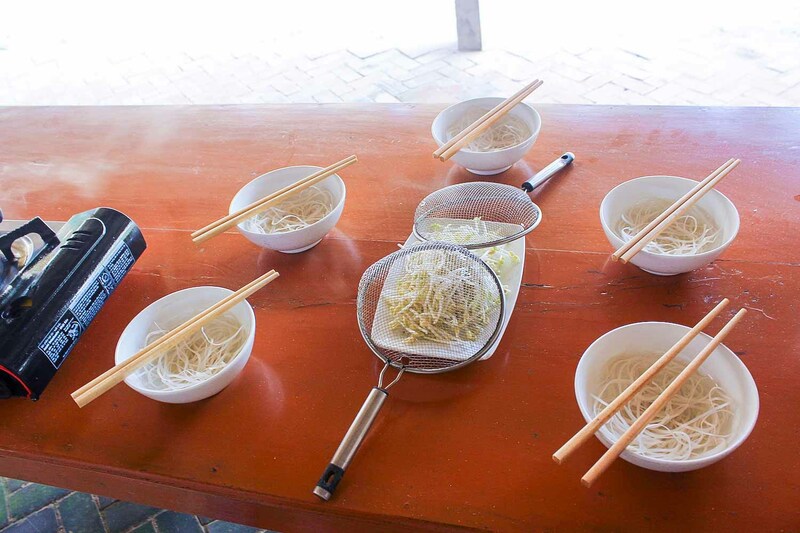 Made with pork, shrimp, green onion and bean sprouts, this is a dish found most commonly on street food stands with a side of tangy Nuoc Cham dipping sauce. 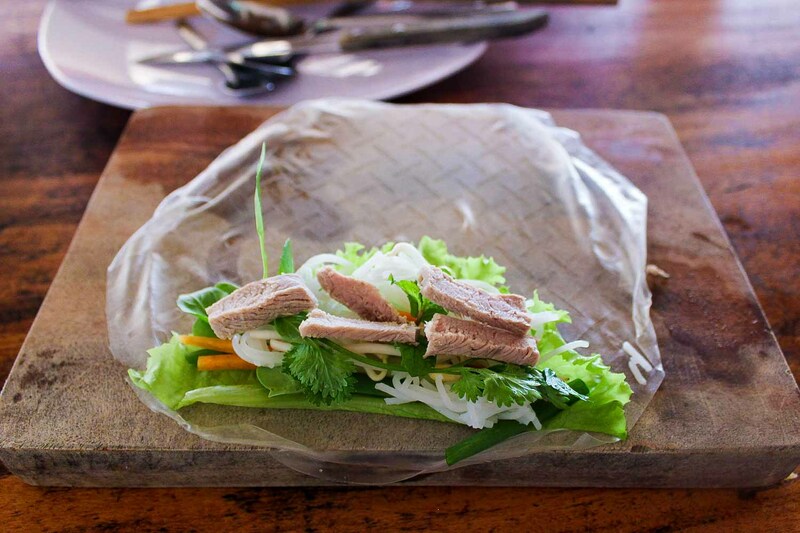 Our chef taught us as a personal favourite of hers she prefers to roll the sizzling pancakes in rice paper with lettuce and bean sprouts stuffed inside. 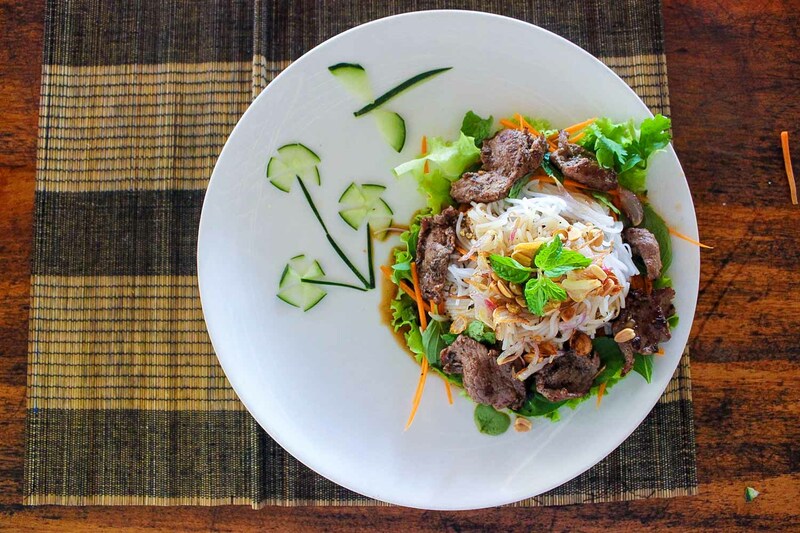 Our third and main dish was Bun Bo Nam Bo, or Southern Style Beef Vermicelli. A lot simpler than it looks, it is made with rice noodles, beef tenderloin, a vegetable mix and burnt peanuts. After finishing our last meal our chef turned our attention to 2 big pots of beef bone broth that had been simmering for the past few hours. 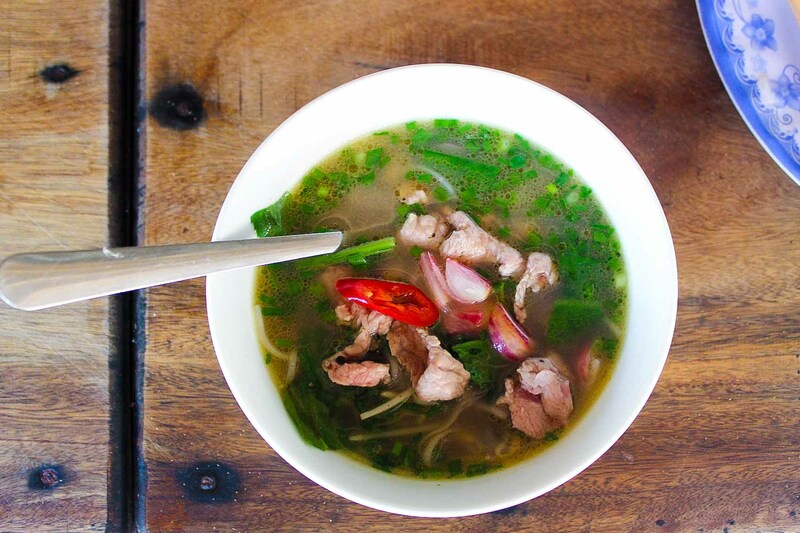 I knew straight away what we were going to be having - Pho Bo Ha Noi - Hanoi style noodle soup with beef (but even we say "pho" in English). After poaching our beef slices in the boiling broth for about 30 seconds we threw them on top of our already softened noodles. Sprinkling some chopped green onion, red shallots, thai basil and bean sprouts it was ready to eat. 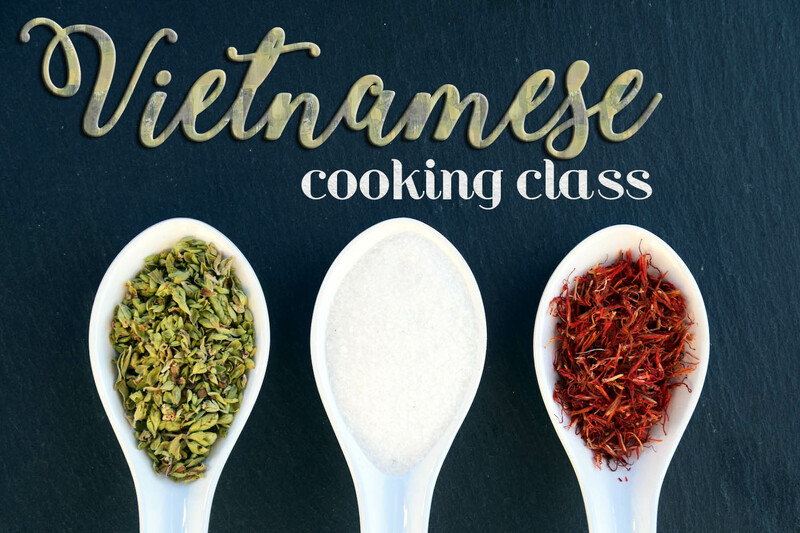 Like I said before, I am not a big fan of cooking, but this class was an absolute delight! Our chef/guide was super friendly and everything was thoughtfully planned to make sure the lesson went as smoothly as possible. Plus the non-stop flow of fresh passionfruit juice served by the helpers kept us refreshed and alert.